These midnight blue wind chimes were a birthday gift this week from my youngest sister. They now hang centrally within the meditation circle, bringing a new layer of sound to the garden. 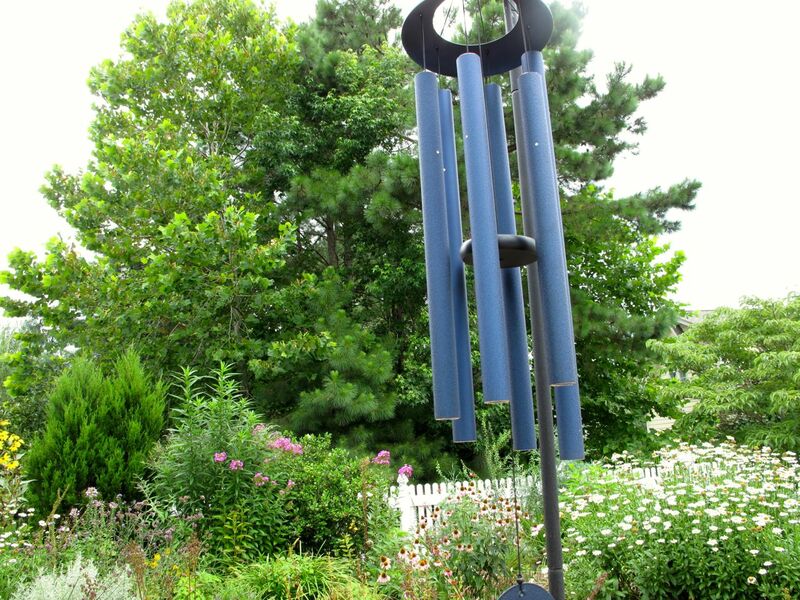 Hand tuned to the scale of C the chimes have a deep tone and resonance that will enhance the peacefulness and amplify the joy of using the labyrinth for walking meditations. 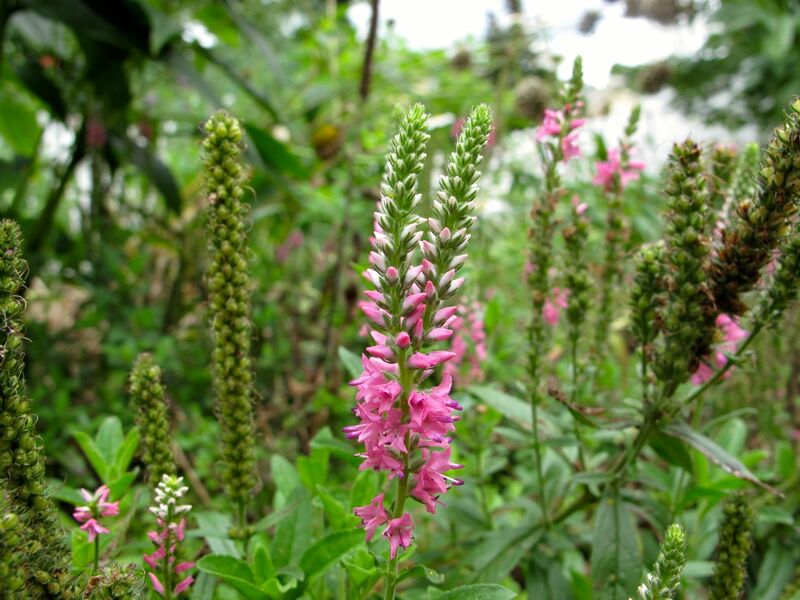 Nearby the meditation circle is a small clump of Veronica spicata ‘Pink Goblin’ (Speedwell). Added to the garden last spring it has grown to 16 inches tall and has spread to about 14 inches wide. 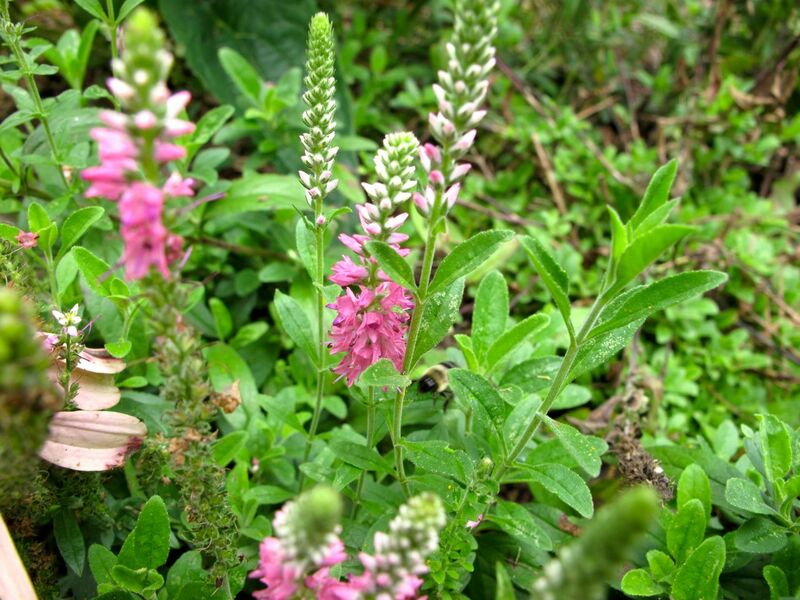 It makes a great low-growing perennial for the front of the border. 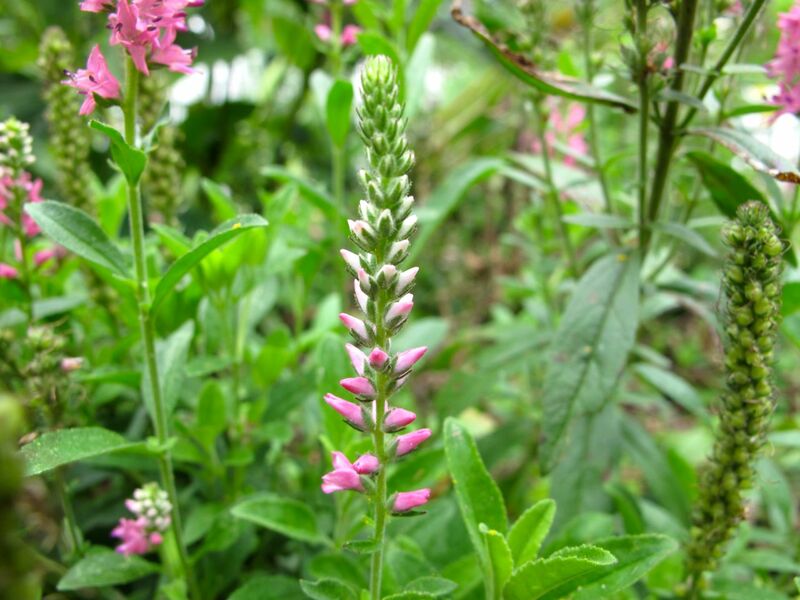 This entry was posted in garden and tagged meditation circle, meditation garden, meditation path, Veronica spicata 'Pink Goblin', wind chimes on July 20, 2013 by pbmgarden. What a wonderful garden, it must truly bring a real sense of inner peace. 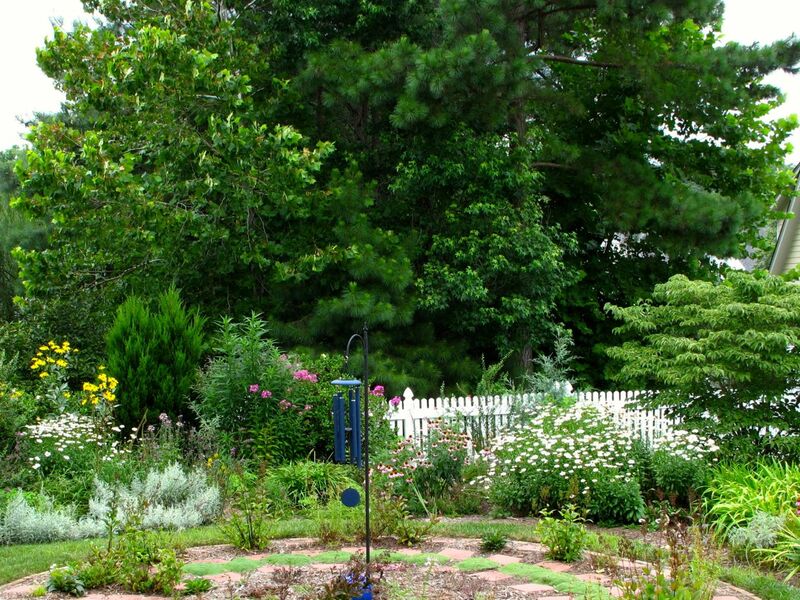 There is something about being in a garden setting that is calming. Thanks for the birthday wishes. The buoy bell chimes sound nice. Interesting how having something to focus on like the sound of a chime can be soothing and calming. Tanti auguri for your birthday. What a clever sister to buy such a perfect present for you. Love the colour too. Thanks for the good wishes Christina. I went out early to walk in the meditation garden before the regular neighborhood hum began. There was no wind so I had to keep nudging the chimes, but they sounded lovely. I’m lucky to have 3 clever sisters who all came to visit to help me celebrate this year. Nice birthday. Let me send my belated birthday wishes too. I’m happy you had a reunion with your sisters. Thanks very much Linda! 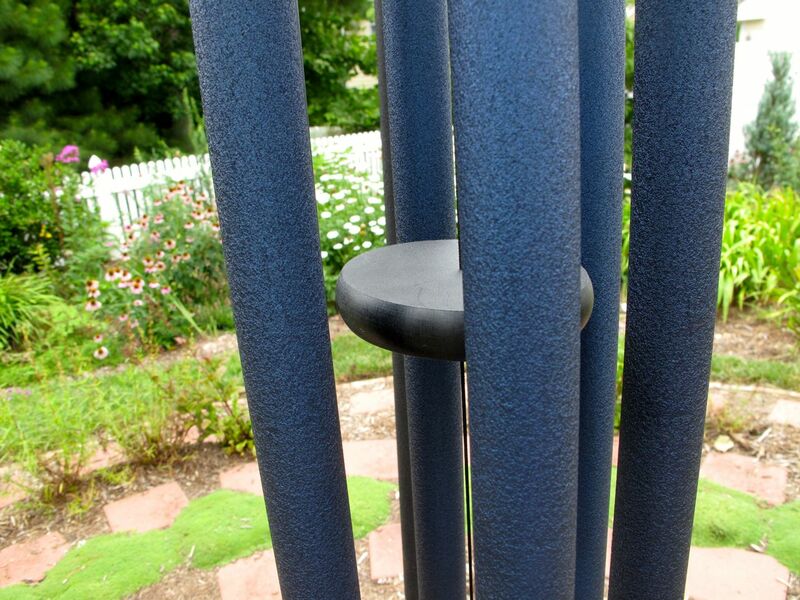 You’ll have to come check out the chimes when you’re by this way. Not usually a big fan of wind chimes but those are very attractive. I’d like to hear how they sound. Thanks. I thought I’d try to record them sometime and post the audio, so you can decide. Belated happy birthday wishes! I also like sound if it’s delicate and gentle. What did you plant in your labyrinth? Thanks for the birthday wishes Annette. I’m not happy with the labyrinth plantings this year and am re-imagining it. Many plants were chosen with drought in mind and the circle has flooded several times this summer from unusually heavy rains. You can see a picture of it when I was more pleased in the post A Perfect Day In May. Also this post describes the original plants: October Meditation On The Meditation Circle. I adore windchimes and have some large ones at the end of the porch that catch the wind beautifully…using yours in your meditation circle is perfect. I love the color. You were smart to place them where they could catch the breeze Donna. So far (and perhaps because it’s the time of year) these aren’t making a lot of sound. Yesterday though the wind caught them for a few minutes and it was very nice. Belated birthday wishes, hope you had a really good day! 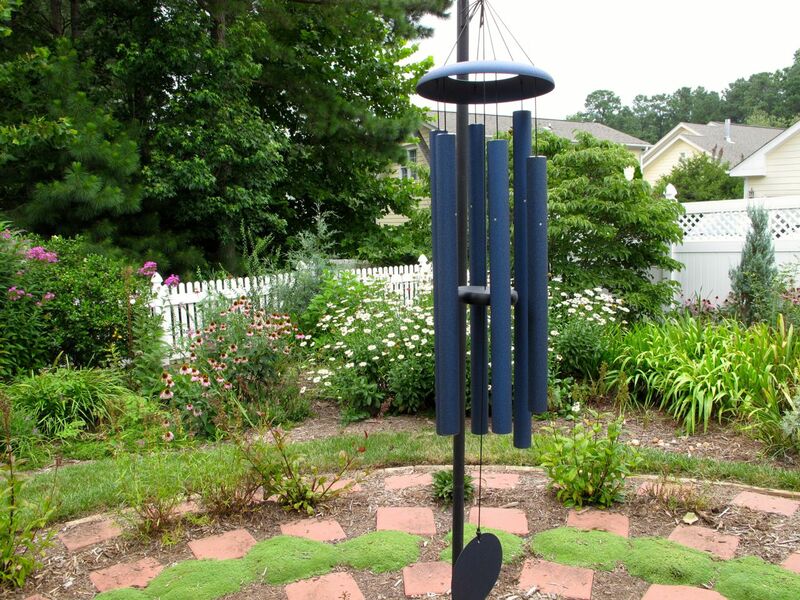 Love your blue wind chimes, beautiful addition to your garden.